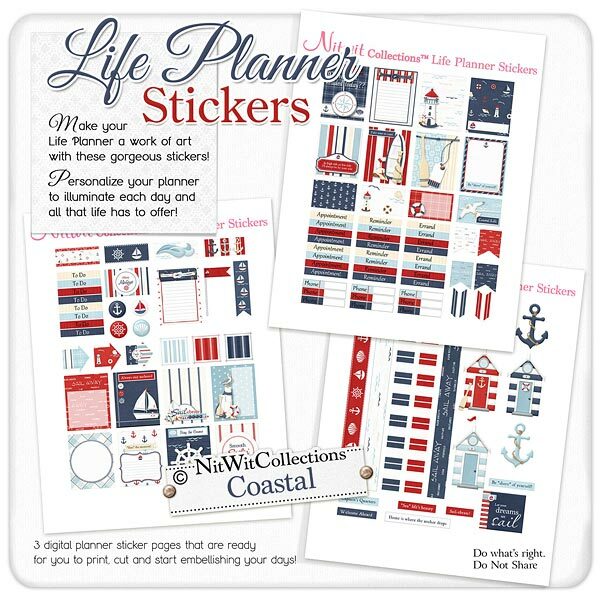 "Coastal" Life Planner Stickers are filled with the sights and delights of being by the water. Can you smell the water....feel the sun on your face....or remember how relaxing it was? Whether it is the thought of the ocean, a cottage, a beach, or even a cruise, this Collection is sure to not disappoint when creating your life planner pages. Does this make you want to go back soon??? 17 - 1.5" x 1.9" full boxes that will give your planners that waterside look and feel with 3 of them having lined areas for checklists, notes, etc. 4 - Small flag elements with the enlightened words to "Sail Away"
4 - 0.6" circle elements, each with different looks on them. Anchor's away!! 1 - Flag in red on a post....where is the perfect "treasure" on your pages that you'd like to stake out?! 5 - 7.25" long digital washi tape like elements...add these bolds strips of colour to give your planner pages such punch! 2 - Anchor digital elements...now what would your pages look like without an anchor to them?! 1 - Word art element - "Let your Dreams set Sail"